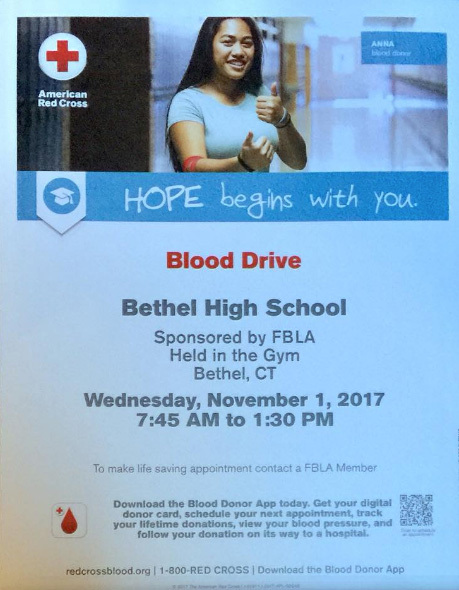 Bethel High School will be holding an American Red Cross Blood Drive on Wednesday, November 1st, at 7:45 AM – 1:30 PM, held in the gym. Download the Blood Donor App. Get your blood donor card, schedule your next appointment, track your lifetime donations, view your blood pressure, and follow your donation on its way to a hospital. Our staff and volunteers will sign you in and go over basic eligibility and donation information. You will read information about donating blood, and will be asked to show a donor card, driver’s license, or other form(s) of ID. You will answer some questions during a private and confidential interview about your health history and places you have traveled. We will check your temperature, pulse, blood pressure and hemoglobin level present in a sample of blood. CLICK HERE to find locations to donate blood nearby.